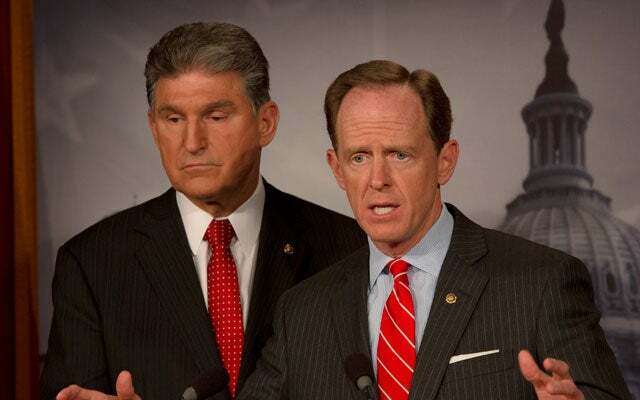 Senators Chuck Schumer (D-NY), Pat Toomey (R-PA), and Joe Manchin (D-WV) have rushed to cobble together some gun control legislation, providing another chance that Senate Democrat Leader Harry Reid can jam it through the Senate before anybody can read and decipher it. Due to the sloppy drafting of the Schumer-Toomey-Manchin (“STM”) legislation, and hopefully not to the intent of the Senators, the legislation could lead to starting a federal gun registry. (2) use the system established under this section to establish any system for the registration of firearms, firearm owners, or firearm transactions or dispositions, except with respect to persons, prohibited by section 922(g) or (n) of title 18, United States Code, or State law, from receiving a firearm. The STM bill fuzzes up the law prohibiting a federal gun registry. First, the legislation says that nothing in the legislation shall be construed to allow establishment of a federal firearms registry. In addition, it says that the Attorney General may not consolidate or centralize records of firearms acquisition and disposition maintained by licensed importers, manufacturers, and dealers, and by buyers and sellers at gun shows (and makes it a crime for him to do so). But then, the STM bill takes those protections away by using the all-powerful word “notwithstanding”—”notwithstanding any other provision of this chapter, the Attorney General may implement this subsection with regulations.” The courts may construe the “notwithstanding” to allow Attorney General Eric Holder to issue regulations that could begin to create a federal registry of firearms, because the law says he can implement the subsection without regard to the protections against a registry elsewhere in the legislation. The courts view the word “notwithstanding” as very powerful. The U.S. Court of Appeals for the D.C. Circuit said in 1989 in Crowley Caribbean Transport v. U.S. in reference to the phrase “notwithstanding any other provision of this chapter” that “a clearer statement of intent is difficult to imagine” to push aside other laws. The same court indicated in 1991 in Liberty Maritime Corporation v. U.S. that a grant of authority to a department head to be exercised “notwithstanding” any other law generally grants the broadest possible discretion to the department head. The U.S. Court of Appeals for the Third Circuit in 1992 in Conoco, Inc. v. Skinner took a somewhat different approach, in which the judges themselves divine the congressional intent whether to let the word “notwithstanding” in a law override other conflicting provisions of the same law. It would be a bad idea for Congress to give Attorney General Eric Holder the broadest possible discretion by empowering him to implement the STM background check legislation by regulations “notwithstanding any other provision” of the legislation. Perhaps the courts would say the anti-gun registry provisions prevail over the “notwithstanding” clause and there can be no step toward a gun registry, and perhaps the courts would say the “notwithstanding” clause displaces the anti-gun registry provisions and Attorney General Holder can start toward a gun registry. The statutory rights of Americans to live free from a federal government registry of everybody who has firearms, what types of firearms they have, and where they have them should not be left to the judicial roulette of liberal judges in some courts and conservative judges in others.